Elizabeth Gabay has been in the wine trade since 1986. She has written about and lectured on rosé wines extensively, and has judged at Decanter’s annual World Wine Awards as well as at many other competitions, including the Mondial de Rosé, the Guide de Vins de Provence and for magazine panel tastings for Decanter and Drinks Business. 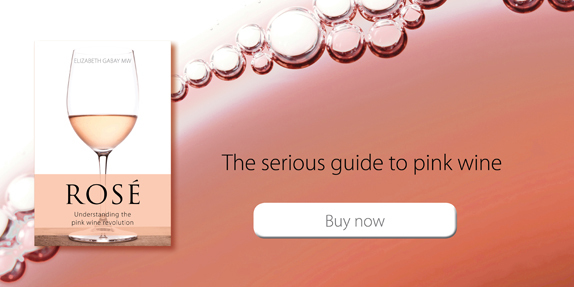 Elizabeth Gabay’s first book, Rosé: Understanding the pink wine revolution, part of The Classic Wine Library, was published in January 2018. You’ve been in the wine trade for more than thirty years and became an MW in 1998 but can you remember your first experience of wine and do you think it had any influence on your choice of career? I grew up in a family who were very continental in their approach to food and drink. Even though my parents were not great connoisseurs of fine wine, they collected wine on all of our holidays round France and I was encouraged to try, and taste. My earliest memory, to my shame, was visiting Henri Maire in the Jura. My parents loved his vin jaune – I was horrified when they bought a case, and tried to dissuade them! But others seemed to recognize my interest in wine way before me. My first wine books were given as presents when I was 16, and the university careers officer suggested I might like working in restaurants or hotels. When I travelled I did visit vineyards – but never thought of it as a potential job. Is there a difference between wine tasting and wine enjoyment – do you ever find Elizabeth the wine taster spoiling the simple pleasure of a glass of wine? I actually think wine tasting helps the enjoyment. Just drinking a wine fast, you may miss the moment of enjoyment. It reminds me of the film Tampopo, when the master says that one should first stop, admire the food on the plate, appreciate its look and aromas, then taste. If you just want the alcohol, just drinking is fine. But I love the moment when you mentally stop and just taste. Even with an ordinary wine. A bottle captures a past summer, a place, the work of a winemaker. It is a bit like meditation. You’ve become a bit of an evangelist for pink wines over the last few years. Have you noticed it becoming any easier to convince people of rosé’s virtues? Sort of … If I say I have just written a book on rosé and I live in Provence, I think the first reaction is oh yes – another PR book with lots of photos of lavender and the sea. When people see the book – the size and extent of the subject – I get their attention. If I can present in a tasting some really interesting rosés – they are converted. What I have really enjoyed is connecting up with the winemakers who are making exciting rosés and working to promote these wines. Would you say there is a genuine revolution in the world of wine towards a more serious appreciation of rosé or is its increased popularity merely a passing fashion? Not sure. I think it may mean the style will split. The high-volume commercial style (possibly with a bit of residual sugar) will continue to be sold alongside reds and whites in bars and chain restaurants. The fashionable, trendy wine – with maybe a designer bottle – I think might fade away as the next fashionable item takes its place. But I think the demise of the fashion statement will be good for the style as a whole as high-quality rosés are then free to emerge without being tainted by the image. Maybe taint is too strong a word – but being a fashionable drink does scare serious drinkers away. I recently went out for a meal with a friend who’s a bit of a wine buff. He suggested we get a bottle of rosé but when, having read your book and being intrigued, I asked if he’d consider getting the Tavel he was quite adamant that we had to have the pale Provence rosé. Have you had any better luck convincing people that pale is not the only pink worth drinking? Only if I can get them to taste the wine, and even better if they can taste the wine in a black glass. But they also have to be receptive to a rosé having a range of tastes. Some people cannot handle a complex rosé – it scares them, disorientates them. On that occasion the owner of the restaurant actually persuaded us into drinking a Lebanese rosé (to go with our Lebanese food). As I recall it was pretty good. Where have you encountered the best rosé – perhaps unexpectedly? Great sommelier. Best? Difficult to say one in particular, and in every region it has been more down to the winemaker than the region as a whole producing good rosé. My biggest surprise was a natural rosé made with Concorde in southern Slovakia. Fantastic wine. The winemaker kept on avoiding my questions about the variety so it went into the book with no variety listed – only later did he admit it was Concorde. Another which has caught my attention is the Negroamaro rosés of Salento in Puglia. The region produces great rosés with the ability to age – I tried a 1976 which was astonishing. Do you have a favourite rosé that you come back to time and time again (or are you still on a mission to try as many new wines as possible)? Still looking for new wines – the joy of wine is that there are new wines every year. And I also enjoy exploring older wines and experiencing new techniques. Rosé is generally perceived as a (perhaps undemanding) summer drink and its popularity tends to wane as the days get cooler. Would you say that was a fair reaction or should we all be downing rosé with our winter casseroles and Christmas dinners? I haven’t yet decided what we will eat at Christmas – so not yet sure what wine. But it is quite possible that there will be rosé. I’m tempted to suggest a rich Bandol rosé, and a sweeter Cabernet d’Anjou with cheese. The last year has been a pretty busy one for you, with promotion of your first book on top of all your other work. Do you intend to put your feet up a bit more in 2019 or are there other projects in the pipeline?